After you add this website, you will be able to let your friends know where they can go to find their free resume. Going to download it--then just click save--save in Desktop-- same file name. Finding it on your desktop is easy and you can edit it later. 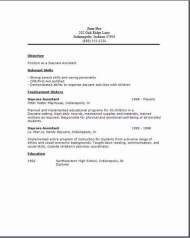 These are the 3 daycare resume formats I want you to use when creating your own resume. They all have a nice look, and you get to choose which one you like the best that suits your own needs. I think these examples are strong in pointing to your skills, so the person doing the hiring won't have to get bored while they are reading your resume. When you first view it, your qualifications just pop right out in front of them. You are giving them what they want. Step by step information. No rubbish to sort through. After all, that's why you are here, to obtain a resume you can actually use. 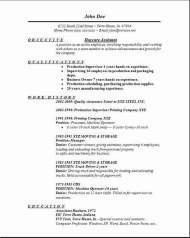 And once you edit this resume with your own information, it will be even better to use since it is telling your own personal past history. I hope you find these free daycare resumes useful. I also hope you get the job. Please tell your friends about this website, visit the job search page and just type in your zip code. All jobs for your immediate area will pop up. Very handy tool. 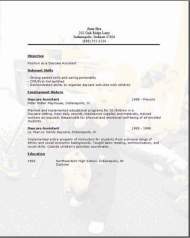 The daycare assistant resume template above with the background added, was a new idea I came up with just to give you some more options. You want to stand out from the rest of the crowd don't you? If mine were in a large stack of resumes, I would want the background effect because depending on the type of position, it works rather well. Most people use Chronological, but it is really your own choice in what satisfies you. If you are going to download one of these free templates, you can always experiment and change the background yourself to something else that is more suited to your taste. Drop me a line or two on the contact us page. I'd like to hear your comments on whether it worked for you in getting an interview. Oh let me remind you to get your cover letter at the top of this page before you go. Good luck to you.